Despite the dominance of neoliberal ideology aimed at economic advancement, two of the main purposes of educational systems still is the cultivation of national identity and the preservation and continued development of social, cultural and political traditions that shape and sustain national identity and the distinctiveness of a society. While some argue that Islam and modernisation are incompatible and to modernise Islamic countries, Islam as a religion, doctrine and political ideology should be eliminated, it is argued here that there are no inherent conflicts or contradictions between Islam and modernisation and that the Anglo-American approach is not the only path for modern societies. Muslim countries can find their own path to modernisation using Islamic principles and Shura as a political ideology. 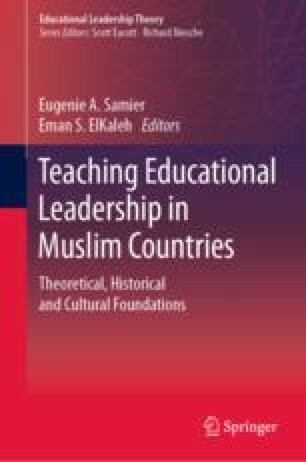 Through the application of multiple modernities, we suggest that teaching educational leadership can be effectively internationalised and modified to serve cultural and social heritage and goals of Muslim countries. Finally, we discuss the characteristics of educational leaders required for nation-building in Muslim countries, arguing that nation-building efforts should involve an extensive use of historical events, traditional narratives and literature that aim to explain and convey cultural values and national ideologies to the new generations. One approach is through hybrid curricula where international literature can be combined with material reflecting the nature and character of Muslim countries, particularly if presenting the field in an interpretive and critical manner and taking into account the collective nature of Muslim societies.